The University of Cambridge is a publicly owned university located in Cambridge, England. Founded in 1209 by scholars who left Oxford (after an apparently bloody dispute with townsfolk), it is the third-oldest continuously operating university in the world. Cambridge and Oxford are known as the two “ancient universities,” and sharing many features in common, they are sometimes jointly referred to as Oxbridge. Between them they have produced a large number of Britain’s most prominent historical figures. Known globally as the university at the epicenter of the tech revolution in Silicon Valley, Stanford feeds hundreds of graduates every year into skilled positions at companies like Google, Apple, and Microsoft. Many of the students there can’t even seem to make it out of school before founding a multi-million dollar company of their own. Technically named The Leland Stanford Junior University, Stanford is located in the Santa Clara Valley (aka Silicon Valley) on an 8,180-acre campus; one of the largest contiguous campuses in the world. One of the most storied, prestigious, and legendary institutions in the world, Harvard will forever hold a place in our hearts as the place in which Mark Zuckerberg totally didn’t steal the idea for Facebook in The Social Network (2010). Harvard University, founded in 1636 and located in Cambridge, Massachusetts, it is the oldest institution of higher learning in the United States. Initially named “New College” or “the college at New Towne”, the institution was renamed “Harvard College” on March 13, 1639 after John Harvard. 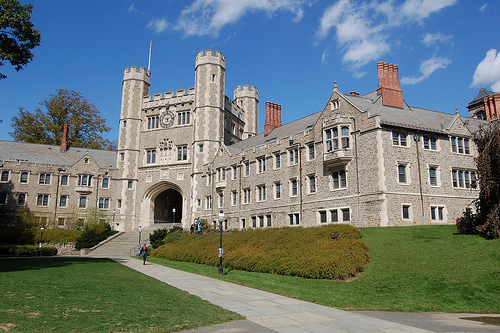 Princeton University is a private research university located in Princeton, New Jersey. One of the 8 Ivy League universities, it currently has 7,567 students enrolled, and was the fourth chartered institution of higher education in the United States. Princeton boasts the largest endowment on a per-student basis in the world, allowing it, in 2001, to become the first university to eliminate the need for loans for all students who qualify for financial aid.